For dry eyes, not all fish oils supplements are the same. A recent study found that re-esterified triglyceride omega-3 fatty acids were superior for tackling dry eye symptoms. The triglyceride form is similar but more economical than the re-esterified triglyceride form. 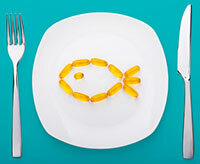 Which Form of Fish Oil Supplement is Best? ProOmega-CRP fish oil includes triglycerides. Dry eye is an increasingly common condition, mostly due to near-constant screen time, menopause and side-effects of medication. The main symptom is dry, itchy eyes (or can manifest as overproduction of tears). A study looked at taking re- esterified triglyceride omega-3 supplements for dry eye.2 It found improvements in tear osmolarity, omega-3 index levels, tear break-up time, matrix metalloproteinase-9, and Ocular Surface Disease Index symptom scores. The daily intake was 1680 mg of EPA and 560 mg of DHA. Discuss with your doctor the amount of omega-3 supplement you need, if any. Typical supplementation is 2,000 to 3,000 mg of Omega 3 per day. High doses can cause bleeding in some people. 3 When selecting a fish oil supplement, read the bottle carefully. The form of omega-3 should be written on the label. Also, look at the amounts of EPA and DHA, and note how many tablets you will need to take each day. Other supplements that can help reduce dry eye symptoms include black currant seed oil. vitamin A, natural eyedrops including specific homeopathic eyedrops which not only help lubricate the eyes but supports natural tear production as well.